Another White House Once Existed in America ~ The History Girl! Surrounded by the imposing seventeen-story VCU Medical Center on three sides in Richmond, Virginia is what appears to be a diminutive three story building. But this building, considered a mansion at the time it was erected, served as the what would later become known as the White House of the Confederate States of America during the Civil War. The home, located on Clay Street, was designed by architect Robert Mills and built in 1818 for John Brokenbrough, the president of the Bank of Virginia. Mills designed many building in Washington, DC including the Washington Monument, the Department of Treasury building, the Old Patent Office Building, and the General Post Office Building. The home was built in the highest part of Richmond, in the affluent Schokoe Hill neighborhood, two blocks north of the Virginia State Capitol. Among Brockenbrough's neighbors were U.S. Chief Justice John Marshall, former U.S. vice president Aaron Burr, defense attorney John Wickham, and future U.S. Senator Benjamin Watkins Leigh. Mills originally designed the gray-stuccoed brick structure as two stories tall and three bays wide. The house has four pairs of heavy double-column pairs with a wide entablature on the rear porch, and sparse iron railings lacking ornamentation. This gives the house a sense of monumentality and simplicity. The front is even simpler, with just a small portico covering the main entrance. White House of the Confederacy, 1865. Source: Library of Congress. The house was sold by the Brockenbrough family in 1844. The house passed through a succession of wealthy families throughout the antebellum period, including U.S. Congressman and future Confederate Secretary of War James Seddon. Just prior to the American Civil War in 1857, Lewis Dabney Crenshaw, a wealthy flour mill owner, purchased the house. Crenshaw added the third floor, rococo-style interior details, and installed a bathroom. He sold the home, complete with furnishings, to the City of Richmond, after learning that the Confederate government would be moving from Montgomery, Alabama to Richmond, Virginia. The City in turn rented it to the Confederate government as its Executive Mansion. The term White House of the Confederacy is not what it was called during the Civil War. It was known by a number of names including "Jeff Davis's House," "The Brokenbrough House," and "The Executive Mansion." Only two references have been found that refer to the structure as "The White House." The White House name became more common in the 1890s and has stuck ever since. Jefferson Davis, President of the Confederacy, his wife, Varina, and their three children moved into the house during August 1861. Jefferson and Varina had six children; three died before reaching adulthood. The house was the birthplace of their daughter Winnie, known as the “Daughter of the Confederacy,” and their son William. Their fourth child, Joseph Evan, died tragically on April 30, 1864 when he fell from the Confederate White House porch. A servant found him, as the parents were not home. He died within an hour. The fall had fractured his skull. 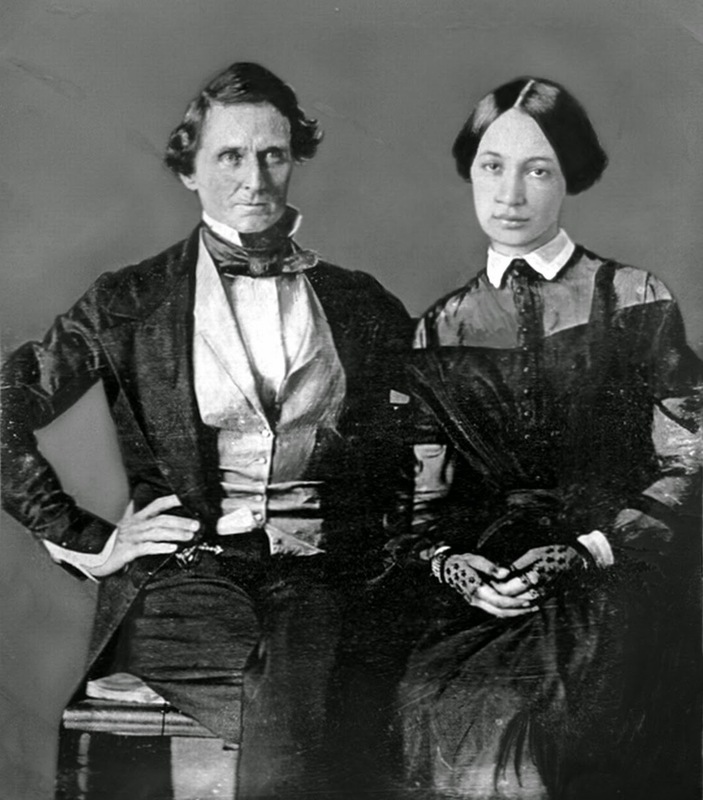 Wedding photograph of Jefferson Davis and Varina Howell, 1845. The Davises, not always accustomed to living in high society, always felt awkward in Richmond. Since the house came furnished, Jefferson brought an opulent alabaster clock from his home in Mississippi. The Davis family remained at the Executive Mansion until the evacuation of Richmond on April 2, 1865. The mansion was seized on April 3, 1865 during the fall of Richmond and President Abraham Lincoln briefly visited the following day. During his visit, Lincoln had lunch and reviewed the first floor of the house, but he did not visit the second floor out of respect for Davis's privacy. After the Civil War, during Reconstruction, the White House of the Confederacy served as the headquarters for Military District Number One (Virginia), and was occasionally used as the residence of the commanding officer of the Department of Virginia. Among those who served there were Major Generals Edward O.C. Ord, Alfred Terry, Henry Halleck, and Edward R.S. Canby. When Reconstruction ended in October 1870, the City of Richmond once again took possession of the house, and converted it into use as Richmond Central School, one of the first public schools in postwar Richmond. It remained a school building until 1890. By that time, the building was overcrowded and the City announced its plans to demolish it to make way for a more modern school. In response to the demolition, women in Richmond spoke out and the building would be offered to them as long as they had a literary mission. In response, the townswomen formed the Confederate Memorial Literary Society. The Society was successful in saving the building, but more damage had been done to it during its time as a school than during the Civil War! Unfortunately, all of the furniture from it had also been sold and there were no artifacts from its time as the Confederate White House. The women formed groups in each state to collect artifacts to fill their new museum. Under the direction of Richmond architect Henry E. Baskervill, it took six years to renovate the mansion, including retrofitting the mansion with concrete floors for fire-proofing. The White House was listed as a National Historic Landmark on December 19, 1960 and added to the National Register of Historic Places on October 15, 1966. In 1976, a modern museum building with climate control to protect artifacts, three floors of gallery space, a library, and administrative space was constructed adjacent to the White House. This allowed the 1816 structure to be restored and reinterpreted to the period during the Civil War. Architects used evidence to find the original layout of rooms, wallpaper colors, and finishes in order to refashion the building from its former life as a museum into a furnished house museum. The $4.5 million restoration took twelve years to complete and it reopened to the public in 1988. Today, the Museum of the Confederacy contains the world’s most comprehensive collection of artifacts and documents of the Confederate States of America, numbering 15,000 and includes: 5,000 domestic items, 3,000 military accouterments, 1,000 military buttons, 510 wartime flags, 300 edged weapons, 250 uniform pieces, and 250 firearms. Although dwarfed by a medical center and its historic physical landscape and viewsheds of Richmond destroyed, the White House of the Confederacy serves as an important reminder of the Civil War and the challenges faced by our divided nation over one hundred fifty years ago.